The portrait-painter Thomas Phillips was born in Dudley, Warwickshire, on 18 October 1770. He was apprenticed to the Birmingham glass-painter Francis Eginton then in 1790 came to London with a letter of recommendation for Benjamin West. West found him employment working on the painted-glass windows of St. George's Chapel, Windsor. In 1791 he began studying at the Royal Academy (of which West was co-founder) and, having experimented with landscapes and historical subjects, discovered a talent for portrait-painting. Here he had to compete in an over-populated field where Lawrence, Hoppner, Beechey, Owen, and Shee already commanded considerable clienteles. By the turn of the century, though, Phillips was attracting lucrative sitters and a rapid advance in his fortune saw him paint the the Prince of Wales in 1806. In the following years he portrayed many of the celebrities of the day including the poets Blake, Byron, Coleridge, Crabbe, Thomas Campbell, Rogers, and Southey, the scientists Banks, Buckland, Dalton, Davy, Faraday, and Somerville, the explorers Clapperton, Denham, Franklin, and Parry, and the artists Chantrey and Wilkie. He was elected an associate of the Royal Academy in 1804, a full member in 1808, and, in 1825, the Academy's professor of painting. As well as authoring many occasional essays on the Fine Arts, he published his Lectures on the History and Principles of Painting in 1833. A fellow of the Royal Society and Society of Antiquaries and founding member of the Artists' General Benevolent Institution, Phillips died in London on 20 April 1845. 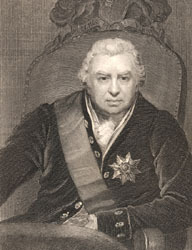 Click on the thumbnail to see a full-size engraving of Phillips's portrait of Sir Joseph Banks. In addition to his portrait of Scott for John Murray, Thomas Phillips painted a number of subjects inspired by the writer's works. 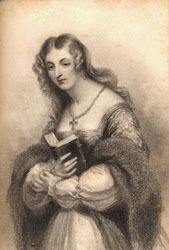 In 1833, he exhibited a portrait of Rebecca (Ivanhoe) at the Royal Academy, followed by Anna Comnena (Count Robert of Paris) in 1835 and Flora MacIvor (Waverley) in 1839. Also in the 1830s, he produced a portrait of Clara de Clare (Marmion) which was engraved for Illustrations, Landscape, Historical, and Antiquarian, to the Poetical Works of Sir Walter Scott, Bart. (click on thumbnail below). Click on the thumbnail to see a full-size engraving of Phillips's portrait of Clara de Clare.